If you know my family well, you know March means family vacation in Las Vegas time. But this year I added a Washington state bonus to my trip. I flew to SeaTac on Wednesday the 27th, and took a rental car down to Tacoma. After checking into my AirBnB, I walked less than a mile down to visit a couple who I'd known back in college. The wife was my core group leader for three years, and the summer between my sophomore and junior years they let me live with them. They're great people. We ate dinner at a restaurant down on the water, and then chatted some more by the fireplace of their home overlooking the Puget Sound. It was great to catch up, and didn't feel like more than a decade had passed. On my way back to my AirBnB I stopped into my favorite little bar, the Parkway Tavern, and enjoyed a beer and missed the friends I used to go there with back in the day. We used to play shuffleboard here. The next morning I went for a 7-mile run down to the water and all the way to Ruston. I used to go for long walks from campus down along the water, and this was the number-one thing on my to-do list for my short Tacoma visit. It did not disappoint. Blue sunny skies and Mount Rainier visible in the distance! At the end of my run I stopped into a coffee shop where I used to love to get a scone. They didn't have the cranberry-orange I'd hoped for, but blueberry was a fine second choice. I ate my scone and drank a latte on the walk back uphill to my room. Then I had to quickly shower and pack up to check out by noon. I drove back to Ruston and got a bison burrito at Tatanka Take-Out for lunch. Feeling fortified, I next visited Point Defiance, a really neat big park. I took a short walk on Owen's Beach (and saw an otter! ), then drove the 5-mile loop once through before finding a place to pull off and take a quick hike into the mossy and ferny forest. I also saw about twenty raccoons on the side of the road, which were cute but also a little creepy since there were so many of them. Luckily I didn't see any while outside of the car. After the hike I stopped into the Antique Sandwich Company for another latte. It was another reminder of missed friends. Sam and Allison's house to meet all their kids and catch up on the ten years that have passed since they moved away from Richmond. Josefina and her husband and baby also joined us. Allison and Josefina and I met freshman year of college and were in the previously-mentioned core group together. So good to catch up! At the end of the night I drove up to stay with Josefina in Lake Stevens, and the next morning I got to hang out with her and her cute little boy. We went for a walk by the water in Everett, then had lunch in Snohomish. And then all my Washington time was over and it was time to drive back to the airport, getting my only peek of Seattle while stuck in traffic. I had been missing Tacoma and the Pacific Northwest a lot lately, so it was a lovely little visit. After that whirlwind came a flight to Vegas and family time! I arrived Friday night, and after my parents picked me up from the airport we ate dinner at the barbecue place at our hotel. The next morning I hit the treadmill for a few miles, and then hung out with mom all day while dad went to the Nascar race. We headed down the strip and stopped at an outdoor spot for nachos and margaritas. Then we checked out the conservatory at the Bellagio. We went to Planet Hollywood (where I saw Gordon Ramsey at a distance, but in real life!) 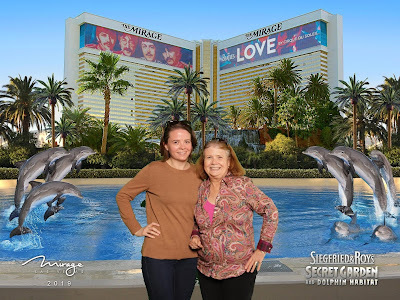 for a spin around the shops and a little slot time, and next we headed back to the Bellagio to visit the art gallery, where we were humorously underwhelmed by the two pieces on display. Eventually we met back up with dad, and enjoyed dinner at the Shops at the Forum. Then we headed back to our hotel and for the second night in a row I went to bed relatively early. More art. Forty-five seconds worth! Sunday dad was off to the races again. 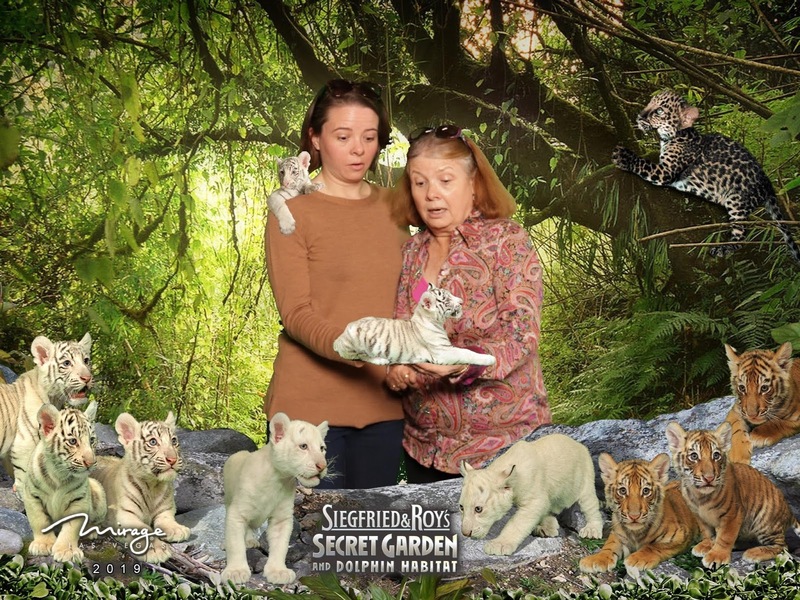 Mom and I ate lox and bagels at the Carnegie Deli at the Mirage, and then ended up at Siegfried and Roy's Secret Garden and Dolphin Habitat. We watched a dolphin training session, checked out a baby dolphin, and visited the lions and tigers. Oh my! After all that fun we walked to the High Roller and took a ride. Had the pod to ourselves! Next up we drove downtown and visited the Container Park for a bit, then grabbed dinner before going to see Sarah Brightman in concert. Dad got us box seats and it was a fun show! After the concert we finally got to meet back up with him, and he and I hung out a while walking around the Venetian and playing some slots until after 1am. Yikes. Monday the three of us ate brunch at our hotel, then headed out to Red Rock Canyon. I always love going out there. We stopped at the red rocks and dad and I climbed around for a short bit, then we drove over to the Lost Creek Trail and all three of us hiked! Mom stopped at a boarded viewpoint, and dad and I continued on to the waterfall before turning back around. After our outdoorsy fun we went back to our hotel and walked to the Venetian for dinner. Then we played a little there and back at Treasure Island before calling it a night. The next morning I hit the treadmill one more time before they drove me back to the airport. Very thankful for my week out west! I've been curious about yoga for a while, but always too nervous to do anything about it. But not this year. I just completed a six-week intro to Vinyasa yoga course at my gym. I was determined to complete all six, with the hope of liking it enough to continue on afterwards. And so far so good. I'm still a little too nervous to go to a "regular" class, but the instructor of the intro course teaches a Vinyasa I/II class earlier on the same night. Two nights ago I went, prepared for my first real class but with a familiar person who would know I still don't know much. It was an unpleasant surprise, however, to find out there was a sub this week! But I persevered. I was brave. And I survived. I'm currently getting over a knotted calf that has messed up my running. I even went to a sports massage therapist to help deal with it. And once again, just like a few years ago when I went to physical therapy for my IT band, I've relearned that everything is connected and weakness in one area (ankles, hips, glutes, etc.) can affect others. And ruin my running. So I'm trying to be good about doing my strength and mobility exercises, and I think yoga should help with my stiff and inflexible self. Fingers crossed. I went home to Santa Fe to hang out with my parents for the holidays. It was so nice to be back. I was there for ten nights and don't remember all the details so I won't give my usual rundown, but I'll throw out some highlights. Christmas Eve I went for a five mile run outside that included stopping briefly for two last-minute shopping errands. I liked being able to multitask. Family came over for our traditional posole and tamales on Christmas Eve before we all went to church together. Then Dad and I walked Canyon Road to see all the farolitos, walked down a really long street with neat big old houses I'd never seen before, and checked out the lights on the plaza. Then we went to the cozy bar at the Hotel St. Francis (which has also become our Christmas Eve tradition) and enjoyed fancy cocktails. Christmas Day my parents and I had a nice breakfast, then Granddad joined us for "tree," then more people joined us for "dinner." The day after Christmas it snowed! Dad and I walked around downtown in the snow. Santa Fe in the snow! One day the three of us ate at Tomasita's before seeing the new Spiderman movie at Violet Crown. 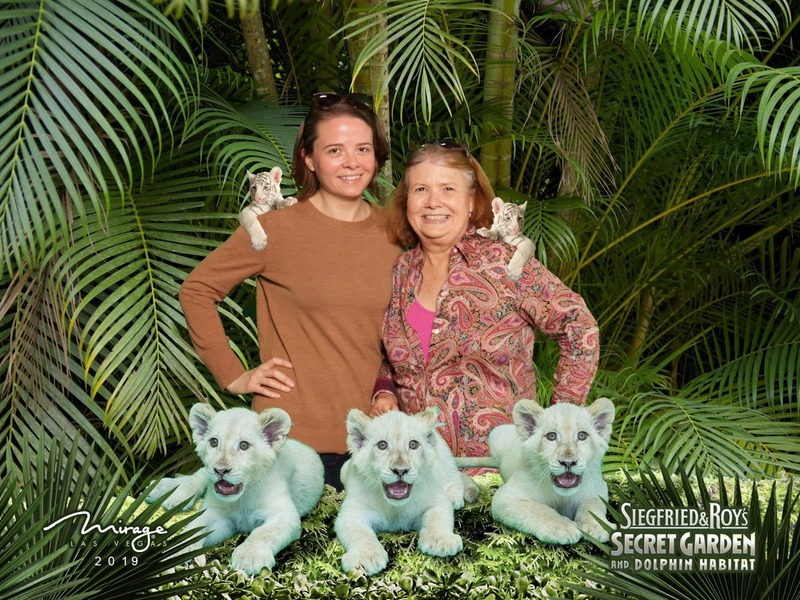 Mom and I really liked the movie. Dad napped. It was also neat to visit another Violet Crown (since there's one in Charlottesville). We only went out for New Mexican twice, and both times I got a giant burrito with green chile. The three of us also watched Godless on Netflix over a few nights while I was there. Dad still napped some though. With all the snow, I helped Dad shovel several times. We also shoveled over at Granddad's house. Mom made scones one morning for breakfast that were supposed to have cranberries but had to be substituted with dates. They were still really good. I love scones. One afternoon the three of us headed to Museum Hill, where we visited a great modern exhibit at the Museum of Spanish Colonial Arts, took a quick spin through the Museum of International Folk Art, and arrived at the Santa Fe Botanical Garden just in time for sundown and their Glow. The place is small so we made two laps (the second one after it truly was dark), and took a hot chocolate break in between because it was freezing. Way below freezing, actually. To warm up after the Glow we visited the Chili Line Brewing Co. (new to all of us) to taste some beer. They do all smoked beers, and they had red and green chile flavors. Those weren't my favorite but it was a fun experience. Sunday after church we ate lunch with Granddad, then Dad and I attended a little handbell concert at St. Francis. Then we walked around downtown some more. Dad and I saw the new Mary Poppins movie, which I really liked, though he did a little napping again. Sheesh. On New Year's Eve I went for another five mile run, only this time everything was covered in snow. It was so pretty! That night the three of us played Tri-Ominos. We had played earlier in the week too. And it snowed some more. Earlier this week I spent two nights in Washington, D.C. for work. (Real work, not PhD work.) I took the train up Sunday afternoon, and after walking a short distance from the station to my hotel to drop off my bag, I proceeded to a Metro station to head toward the National Cathedral. My plan was to get there in time for a snack and a look around before attending the 4pm evensong service. After my Metro ride I had to walk over a mile (uphill!) to finally get to the cathedral. And then I discovered it was closed and services were canceled so they could prepare for President Bush's funeral the upcoming Wednesday. I was pretty bummed as I'd really been looking forward to the service, but I did get a peek at all the action happening as workers bustled around the grounds moving stuff inside and preparing for the big day. Glumly I left the cathedral grounds and found a pizza place for my (really) late lunch (early dinner? ), from which I consulted my phone for backup activities and decided to check out Zoo Lights at the National Zoo. Another mile-plus walk and I arrived at the zoo just as it got dark. It was pretty crowded and I was actually a little disappointed in the lights, but it wasn't too cold out and gave me something (free) to do on a Sunday evening. Afterwards I took the Metro back toward my hotel, and had a small dinner (second dinner?) before calling it a night at 7:30 with very tired feet. Monday morning I walked a few (big) blocks to the Library of Congress, and spent all day in the manuscripts room of the Madison building. When that closed at 5 I spent another hour and a half in the newspaper room. When I finally left the library, with dinner on my mind, I noticed lots of unusual activity happening outside the library and near the Capitol. There were large Red Cross tents set up, some streets closed to traffic, lines of people in corrals, and big stadium lights shining on the Capitol. Wondering what the heck was going on, I consulted my phone again. The first thing to pop up was a news story about how President Bush had arrived at the Capitol to lie in state and lots of important people were inside with him. At the end of the story it said the public would start being admitted at 7:30. Not having any other plans for the evening (other than eating) and knowing what my dad would do if he were in my position, I joined the line of public visitors waiting to enter the rotunda. After forty-five minutes of waiting for them to start letting us enter, the line started to move slowly but steadily. When we entered the building we had to go through security, and then there were more lines inside. We stopped moving completely for a while, which was when President Trump made his visit. Then we kept moving and finally got to the Rotunda. It was quiet and respectful inside, and I was probably in there a total of two minutes as I moved slowly in a half circle around the President's flag-draped casket. It was neat to get to visit the Capitol's rotunda for such a special occasion. And I was okay with the fact that I didn't get out until 9pm and thus had a late dinner. Tuesday I was back at the Library of Congress, only this time I started in the Rare Books and Special Collections room of the Jefferson building. Then in was back to the Madison building and manuscripts for most of the day, except for a quick jog back to the Jefferson building to see a book in the main reading room. I had been nervous I might not get everything on my list done, but I finished at 4:30, with 30 minutes to spare! Since my train didn't leave until 6:30 I had a little extra time to kill. I thought I'd just walk down the National Mall a little, but the first place I came upon was the U.S. Botanic Garden and they very serendipitously were open late on Tuesdays, so I got to take a stroll around and check out plants and their train station displays. I also got to continue carrying the coffee I'd just purchased before heading to the mall, and it was much warmer in the greenhouses than outside, so it was all around a winning experience. After seeing all there was to see I walked back to my hotel to grab my bag, then headed to the train station. Overall I really enjoyed my three days in D.C. Lots of walking and productive work and seasonal displays and attendance at a very historic moment! I live in a new-ish neighborhood of town houses. I remember watching the development being built from my old apartment (it's true, I didn't move far) and hating the sight of it, thinking it looked too much like Northern Virginia. When I started looking for a house to buy, I didn't even consider looking at these town homes. I was really against them for some reason. But my real estate agent wanted me to see one of the units just in case, and sure enough I ended up liking it. I liked the size, the location, the fact that I don't have to do any yard maintenance, and the amazing view off my deck. So here I am, in a place that is great overall even if it has the soul-less look of NoVa. Unfortunately I don't really know most of my neighbors. Being an introvert, I'm not great at meeting new people. There was even one terribly awkward time when I shoveled snow for an hour right next to my neighbor who was also shoveling snow, and we didn't say a word to each other. (To be fair, I think he might be even shier than I am. I coincidentally sat next to him at a movie once and he fumbled a little, not knowing how to reply to my "hi there, I think you're my next-door-neighbor" besides saying "my wife will be right back" and leaving the rest of the talking to her.) Anyway, I don't really feel much of a sense of community with my neighborhood except for one day of the year: Halloween. My street is awesome on Halloween. Lots of houses decorate for the occasion. My pumpkin and owl decoration look pretty measly compared to several of the houses. And apparently word has spread that it's a good street for trick-or-treating, because we get a ton of kids. Today my coworkers were complaining that they had little or no kids show up at their doors last night, but I sat outside on my stoop with a steady stream and passed out over 300 pieces of candy. Some got two pieces. Some only got one. That means a lot of kids. Clearly many (most) of them don't actually live in the neighborhood. But I love that on this one night a year I join a bunch of my neighbors hanging out outside sharing candy and a friendly Halloween spirit with kids from our larger community. It makes me proud of where I live, and happy I ended up in this place at which I originally turned up my nose. After not riding my bike outside at all in 2017, I did pretty well on the cycling front in 2018. Most of it was training for my August triathlon, but I kept it up until mid-October. Over the summer I did two rides with friends, a couple solo rides on the Capital Trail outside Richmond, a couple solo local rides, and that mountainous group ride as part of the Red Wing Roots Music Festival. After the triathlon I wanted to keep up my cycling fitness and build up my mileage to do a metric century, and some of those weekend training rides were spent inside attending two cycling classes in a row at the gym (plus a little extra after the second class, until I reached 40 miles on the bike computer). Heading off for 60 miles around Culpeper County. Two weeks ago I drove up to Cupleper to attend my third Culpeper Century. I just did the metric century ride (about 60 miles), which went well. It's a pretty ride but it was really overcast all day and I didn't get to see the mountains in the distance. About to start the Tour de Greene. This was probably my chilliest ride ever and I wore a jacket plus wind breaker. I warmed up plenty once riding though. I thought that would be my last ride of the season, but then I learned about the Tour de Greene the next weekend and wanted to do another 60 miles. So last weekend I drove to Stanardsville for that ride, but about 11 miles in I found myself losing steering control and realized I'd gotten my first flat tire ever. Knew it would happen eventually. I pulled off the rode and up a little driveway to get away from the road, and luckily a really nice lady spotted me as she rode by and decided to stop and help me out. I was prepared to figure out how to fix the thing myself (even if I had to use my phone to look up tricky parts), but it was so much better to have someone helping who knew what she was doing. It still took a while and involved her telling me I needed to clean my chain more often and probably need new tires. Oops. Getting ready to fix my flat rear tire. But look at that beautiful sky! Labor Day weekend I went camping with some friends. We like traditions so we returned to Crabtree Falls Campground where we'd camped the year before, and even stayed in the same two sites. We also arranged our tents in the exact same places as last year, though I'm not sure all three are ideal spots. Anyway, it was fun. I wish I had time to go camping more often. We'd been worried about storms in the forecast, but luckily the weather wasn't too bad. We showed up Friday night and got set up and then enjoyed Cory's homemade grilled pizzas. And of course we had a fire. Luckily it didn't start to rain hard until we'd reached the cars. Then it poured for a little while and got all our chairs wet even though we'd gathered them under a little popup tent. Oh well. Once the rain calmed down a little and we'd all had some food we sat under the popup and played Mexican train dominoes. And when we realized it really wasn't raining any more we took a break to go down the little trail from our camp site and check out the river. It was running much harder than last year. For dinner Saturday I made everyone frito pies. Then we had another fire and made s'mores before one more game of dominoes. Sunday we ate more bagels for breakfast and then packed up our site. I'll be honest I was bummed we were all cleared up and ready to leave by about 9:45am. I wanted to stay longer. But at least we kept the fun going by stopping at Devil's Backbone Brewery on our way home for a 3k walk and an outdoor lunch. I'm ready for a 3-4 day camping trip next time, but it was still fun to get outside with good friends. Hopefully we'll do it again next year! I like history, running, temporary tattoos, and finding pistachio shells. Oh, and my grandparents love me.